Andrew is a rockin' stud. It's a given. Want to know what kind of mad skills this man has? He re-plumbed the laundry room, fixing a leak. 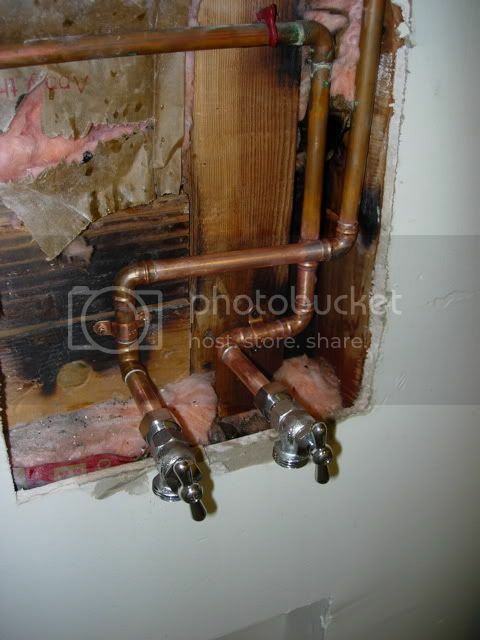 He replaced the copper pipes. By himself. Check it out. He's unclogged the bathtub in our bathroom, and now he is working on replacing both upstairs bathroom fans. The amazing thing is the time schedule that this has all been accomplished in. We had to call an electrician to come in tonight because we decided that with the aluminum wiring that our little house has, we should call a professional instead of risking Andrew's life. Sentimental me, I'm a little attached to the fella. What can I say? I used to think that the sexiest sight was a man in the kitchen. I think I may be shifting that to a man in a toolbelt.